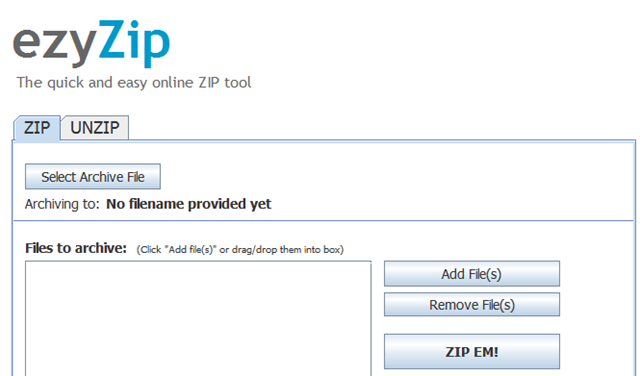 How to zip/unzip archive online without installing any archive manager? So for zipping, what you need to do is just add the files you wanted to archive, then click on ‘Select Archive File’ to set the name and the directory for your archive, lastly ZIP EM!. 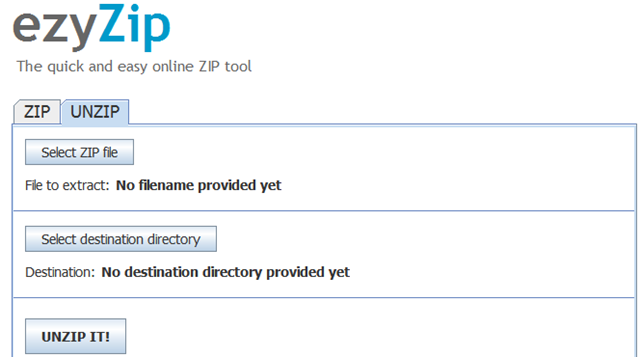 For unzipping, just select the zip file and select the destination directory for extraction and UNZIP IT!, voila, you are done. Easy isn’t? If you like ezyzip, check out http://www.ezyimageresizer.com as well. Lets you batch resize images. Same principle: No uploads/downloads to a server and no installation required. Free web-based utility to uncompress, create, convert archive files from a url and browse system. Formats supported: zip, jar, rar, 7z, tar, tgz, tbz2, nth, thm, lzh, chm, bzip2, gzip etc. Looks nice, although I use http://www.unziponline.net for unpacking the files or zipping the files. Very simple website, but it’s just working fine for me!